My initial decision for this post was to write an in-depth review with pages and pages of blurb but I decided against that. I use my mobile phone as ……. well as a mobile phone, so I really don’t care if its appointment and contacts feature can out do Microsoft Outlook or that you can write a complete 500 page novel using the built-in word processor. This phone has a 3mpx camera with autofocus great but it still produces rubbish pictures just like all the others, honestly would you go on holiday and rely on your mobile phone for the pictures – I thought not!! For a more exhaustive review with lots of detail visit here. Back to the phone in hand. The D900 is very well built with no obvious creeks or flexing when handled, due to it compact and thin nature (only 12.9mm height) it feels extremely sturdy and dense. A nice change from all them plastic and hollow feeling phones which are so prevalent. The outer casing is mostly a black soft touch plastic with the top and bottom having a nice fingerprint friendly gloss black finish. 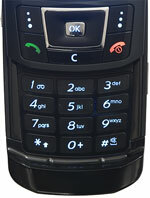 The slide mechanism is smooth and easy to operate so the phone is useable with one hand. Interestingly the mechanism is not damped which would have been a nice touch at least you can attach a sound effect to the opening and closing sadly they did not include the Star Trek woosh’ing door sound. Ergonomically the phone is excellent and the only downer is the lip at the bottom of the keyboard which I find makes it difficult hitting the bottom row of buttons – this probably will not apply to people with small hands. 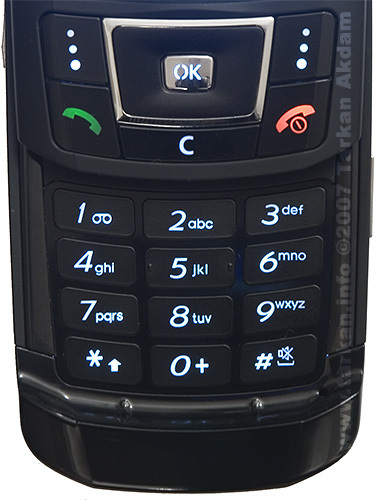 My previous phone was the Motorola V600, and the Samsung has turned out to be a very good upgrade however there where some features on my Motorola which I could have lived without on the Motorola but you are left wondering why they are not present on the Samsung. Some of these things are so basic it makes you wonder if anyone actually used the prototype outside of the lab. We are only talking about software features so hopefully future firmware releases may fix some of these issues. Before I have a moan about the problem areas, the phone has had a positive change to the way I use my mobile. The built-in email client is very usable and it has allowed me to ditch the pda on many occasions. One thing missing which would be nice is the ability to stop the client setting the read flag on the downloaded emails at the server, as I do not necessarily download emails to read more to check if there is anything urgent waiting for my attention. My version of the phone came with Opera mini web browser installed and I was impressed with the rendering quality as well as the general browsing speed, I have used it many times to look up travel information on the move. hey!! i have the same goes for my mobile … a blue ambulence kinda light icon appear on top beside the network icon that never goes and somtimes turn to red and makes vibration and to cancel it i have to press the red button that ends the call..
Just select Mass Storage and it will appear as a removeable drive, to do with the content as you wish. i’ve taken a few videos and photos on it..
all i want to do is transfer the photos and vids to my pc..how on god’s earth do i do this?? as for the SOS thing..does it matter if it’s on or not? heyy, I have a d900 and on it there is a icon at the top of the screen, its red and blue and pops up two bars icons away from the bluetooth, No idea what it is can anybody help? hey.. does any one know how to turn of da sound whenva u touch a button on the d900..i find dt very iritatin n wnt it of..
…and I can see it annoying people in my office if I’m away from my desk for half an hour! I am shocked that even the newer 900i model still has not corrected this problem. Samsung really need to go and use their phone in the real world and then they may realise the need for this. I have just worked out that you can set the incoming text tone to repeat every minute or every two minutes. Not ideal though. Thanks, I am glad the review helped!! I learnt early on to keep the battery topped up, I do think that for phone like this you really need some sort of alert for voicemail and missed calls – as you say maybe on the next model. What does drive me crazy is that you can’t run the battery down faster once the low battery alert starts without spending money (ie. calling someone). I tried to run it down faster by taking a photo, using the MP3 player or playing games, but it doesn’t let you do any of that. Just the annoying “Battery low!” I KNOW IT IS!! “I looked in Menu > Settings > Sound Settings > Message tone , only changed the repetition for text messages – not voice mail or missed call. Maybe the firmware has been changed on the 900i , my phone after owning it for over 1 year, still only has a low battery warning for less than 2 hours before powering down. I looked in Menu > Settings > Sound Settings > Message tone , only changed the repetition for text messages – not voice mail or missed call. On the message tone menu what other choice are there? My phone (I have the D900i)will beep low battery for almost 24 hours before turning itself off! I personally can’t stand the low battery nagging, so how do I get rid of it? Which is weird because there is a setting for missed calls/texts and you can change how often it alerts you. It’s found it Menu > Settings > Sound settings > Message tone > after you pick what tone you’d like, you can change the repetition for once, every 1 or every 2 minutes. Hope this helps. Sounds like you have the bluetooth enabled which is the icon you describe. It does sound like you have a faulty phone or battery, but before you get worried about it try the following. press menu / applications / bluetooth / activation and set to off. This will remove the blue icon. Then charge the battery up and then time how long it stays on, opening the slide up every hour to check the phone is still on. Also you can also try doing a phone reset which can be found Menu / settings / reset settings. well with my phone i got only one serious problem. the problem is my phone starts to turn off by its self indeed the batt is high i mean the batteries bars are full but i dont understand why it stat to turn off by it self , which i got very important calls to be missed. one thing more a blue ambulence kinda light icon appear on top some times which never went away. i have read the menu the icon information is not mention there. so kindly reply me on that problem’s i will be thanks full.